WEST WINDSOR – At age 62, Norm Glover was the 2012 student speaker for Mercer County Community College’s Commencement ceremonies, sharing the dais with then-Newark Mayor Cory Booker. He’s back on campus now, this time as a counselor advising students on their healthcare options under the federal Affordable Care Act. But then again, it’s like he never left. Glover, of East Windsor, is a Vietnam veteran who earned a Purple Heart for wounds received during combat. He dropped out of high school in eleventh grade to join the Army, where he earned his GED. Glover was inspired to earn his associate degree when his job was eliminated during the most recent economic recession. 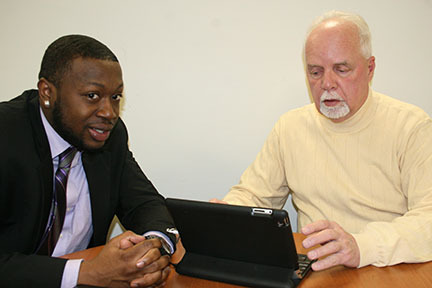 Norm Glover, right, was the student speaker for the 2012 MCCC Commencement Ceremonies, and is now back on campus with the New Jersey Hospital Association, counseling students on healthcare options under the federal Affordable Care Act. In his new career, Glover is a certified application counselor for the New Jersey Hospital Association (NJHA), coming to the West Windsor Student Center on Friday mornings to provide one-on-one sessions with students looking to explore their healthcare options. He said the new mandate requiring health insurance is complicated and confusing for many individuals, and his goal is to simplify the process. As part of his job, Glover reviews the options that include the Marketplace Health Plans, as well as NJ FamilyCare programs. Glover, who started taking classes at Mercer in 2003, said his familiarity with the campus and many of the students, faculty, and staff has made the job easier in some ways, but also has its drawbacks.